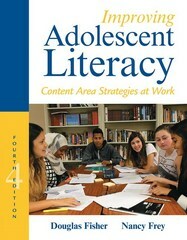 Improving Adolescent Literacy 4 Edition Note: This is the bound book only and does not include access to the Enhanced Pearson eText. To order the Enhanced Pearson eText packaged with a bound book, use ISBN 0134170733. Practical, straightforward, and affordable, this guide gives middle and secondary school teachers the tools they need to support their students’ comprehension and success in literacy and in content area learning. The classroom-proven strategies and procedures included are taken from the authors’ and their colleagues’ experience in middle and secondary classrooms. Each chapter opens with a vignette from an actual classroom to show readers effective teaching in action and to give them a look at how the chapter’s instructional approach works within content area teaching. Research-based rationales for each strategy follow the vignettes and provide an in-depth look at how to implement the strategy, along with examples of each strategy across the curriculum. The Enhanced Pearson eText features embedded video and assessments. Improve mastery and retention with the Enhanced Pearson eText* The Enhanced Pearson eText provides a rich, interactive learning environment designed to improve student mastery of content. The Enhanced Pearson eText is: Engaging. The new interactive, multimedia learning features were developed by the authors and other subject-matter experts to deepen and enrich the learning experience. Convenient. Enjoy instant online access from your computer or download the Pearson eText App to read on or offline on your iPad® and Android® tablet. * Affordable. The Enhanced Pearson eText may be purchased stand-alone or with a loose-leaf version of the text for 40-65% less than a print bound book. * The Enhanced eText features are only available in the Pearson eText format. They are not available in third-party eTexts or downloads. *The Pearson eText App is available on Google Play and in the App Store. It requires Android OS 3.1-4, a 7” or 10” tablet, or iPad iOS 5.0 or later.